Turn fuzzy and dull into clear and bright especially at night! I was skeptical about trying the Night View glasses, but I am impressed! The glasses fit well and work great. I can see the curb so much more clear with them on. My husband will be thankful that I am not scratching up the rims on my car anymore! I drive on dark country roads every night coming home from work and I am loving my new view from my Night View NV glasses! I can actually see two headlights now rather than just one blurred bright line of light. 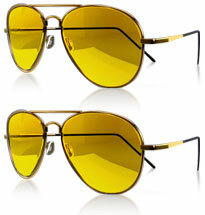 Plus, John Goodman wore them in the Big Lebowski, so I feel like a celebrity! My mom never wants to drive home in the dark, so I purchased her a pair of Night View glasses praying they would work so she could stick around for birthday parties and not miss out on all the fun. THEY WORK!!! Problem solved. Now, I have an extra babysitter for my kids so my husband and I have more nights out. Winner Winner! I am buying an extra set so she never is without a pair! What a life saver …… Thank you Night View HD! I just suffered from Bell's Palsy which kept me from driving due to issues with my eye and the brightness of the sun and snow. My co-worker had a pair of the Night View glasses and let me borrow them and I cannot tell you what a difference they made. I was able to drive myself to and from work keeping my eye from watering from the glares and not being able to blink. Now that I am healed, I still use them as they make it so clear to drive day and night. I bought a set for myself – one for each car. 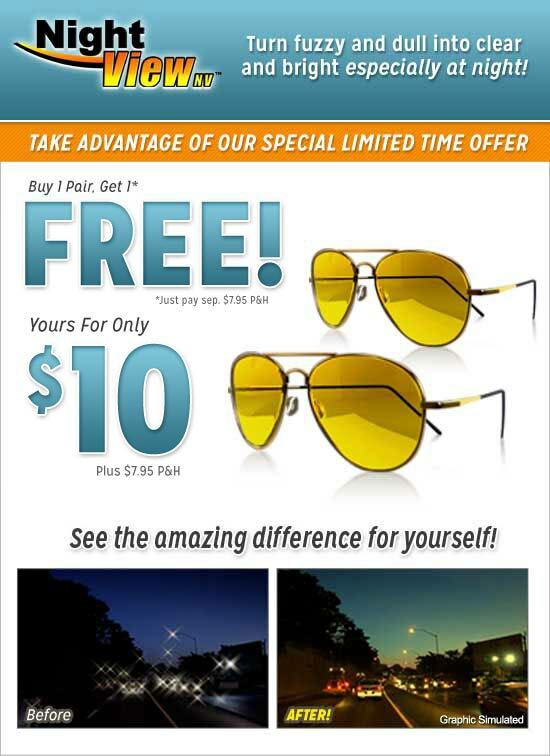 Buy one pair of Night View NV Glasses for $10.00 plus $7.95 P&H and we'll double your order for FREE! Just pay separate $7.95 P&H. Total set $25.90. PA residents add sales tax. 30-day money back guarantee less P&H. Continental U.S. orders only..
©2019 Night View NV™. All Rights Reserved.